Dabang Delhi banned the Bengal Warriors on the tie in the Inter-Zone match in Season 5 of the Pro Kabaddi League (PKL). It was tied 31/31 at Netaji Subhash Chandra Bose Indoor Stadium on Thursday. Both teams played equally in the first half. 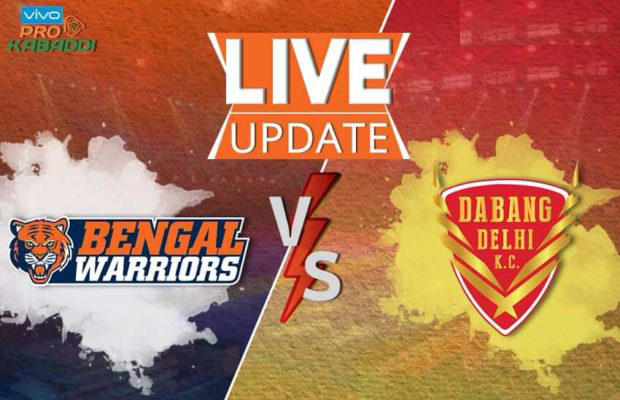 In the second half, Bengal Warriors started well, but in the last minute Dabang Delhi came back and finished the fight tie. Following this victory, Bengal Zone remains at number one with 45 points. For Bengal, Maninder Singh has 13 raid marks. In this match, "Bengal Warriors" had to finish their losing streak in the domestic stage. In the last two matches, Thed had two successive defeats. In the first three games played at home, though he managed to win the trio. In the first half, both teams went with a score of 12-12. Bengal Warriors played a good game in the second half and took the lead 21-13. *Dabang Delhi* did not give up and continued to reduce the number of points with consecutive points. Delhi captain Miraj Sheikh was injured during this time and he was taken out on the Stretcher. But Delhi's game did not stop there and he was finally able to tie the end of the match, equalling 31-31 in the end.